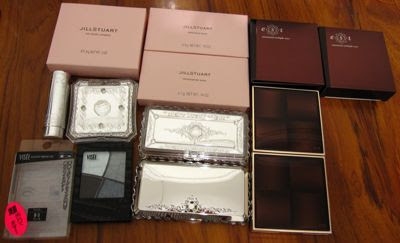 I wasn't happy with the photos that I had taken earlier of my new Jill Stuart stuff so I decided to re-take them along with the rest of my Jill Stuart collection. 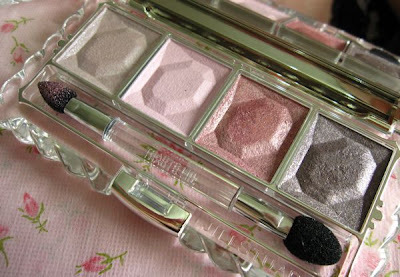 I've adored the brand ever since its inception and own way too many of their palettes as I like the shimmery and pigmented textures, as well as the princessy packaging. 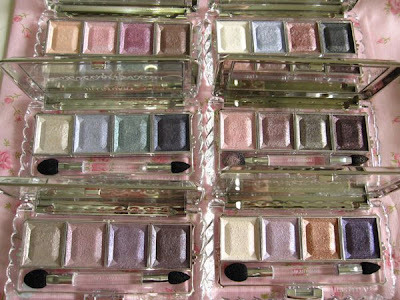 Some of the shades can get quite repetitive, especially the multitude of pinks but there are also some very unique complex smokey shades that are great fun to experiment with. There's a distinct lack of intense emerald shades though, hopefully this will be rectified in the future as I think Jill Stuart does jewel tones very well. 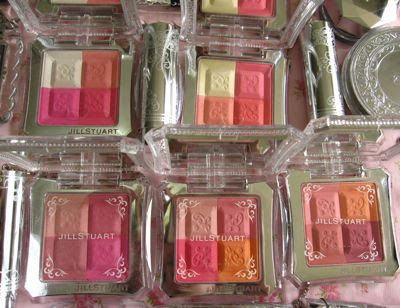 If I could only use one brand of eyeshadows, I would be happy with just using Jill Stuart. 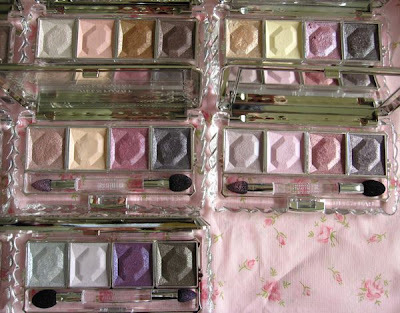 I took these photos next to a window during the daytime so the eyeshadow shades look more muted. Romantic Poppy is very similar to Fresh Apricot except that Romantic Poppy has slightly darker shades. 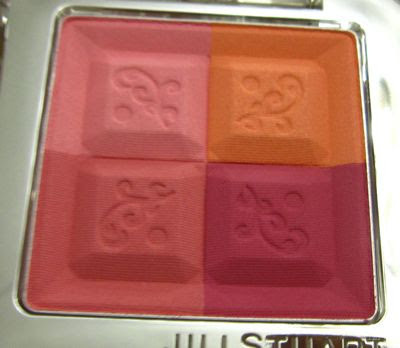 But once mixed and applied, the difference between the two blushes is too subtle to tell. 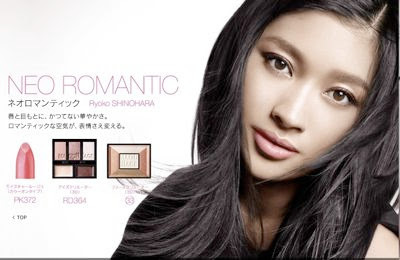 So if you already own Fresh Apricot, I would not recommend Romantic Poppy. Romantic Poppy applies as a matte medium rose pink. On me, it's quite average, not really knock-my-socks-off fantastic but as with lots of Jill Stuart makeup, the focus is on getting a pretty, feminine look. 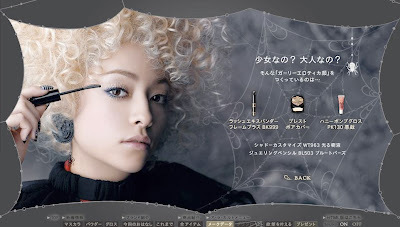 The Lunasol SA at the Takashimaya Kanebo counter told me yesterday that the spring collection will arrive on 20 February (Friday) and there will be a 3 day event with a makeup artist from Japan. 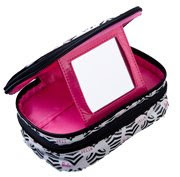 All you have to do is make a purchase of any one item (on that day) to enjoy the makeover. I've already made my appointment for 21 Feb :-) The SA also said there is no increase in the prices, despite the high yen, which is great news! 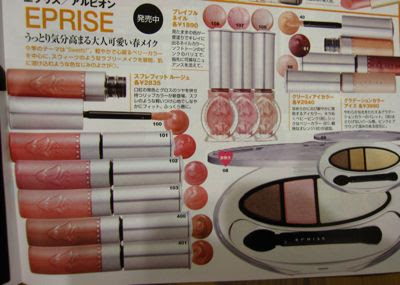 At the current rate, a Lunasol palette costs the equivalent of S$88 in Japan, compared to the current retail price of $77 in Singapore. 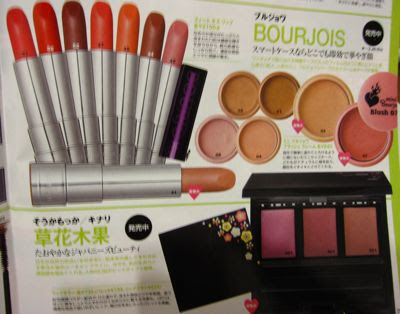 According to the SA, the Coffret D'Or spring collection will arrive only in March. She knew that it had already been launched in Hong Kong and Taiwan but for some reason, Southeast Asia would get the collection only in March, 4 months after the launch in Japan. 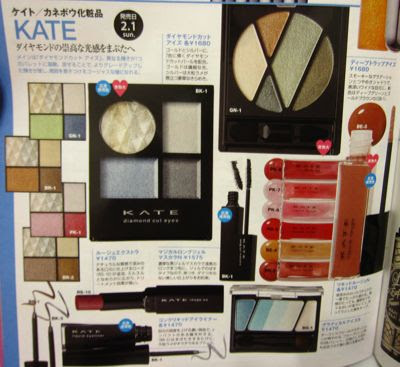 I was browsing through the local edition of L'Officiel magazine and it featured the RMK Cheeks & Eyes Palette for S$49. That's a lot cheaper than the Japan retail price of 5250yen! Not sure when that will be launched though. Tangs department store will be offering 12% rebate cardmembers on 4-5 Feb! Cardmembers also get additional 10% off sale itesm at Tang + Co. 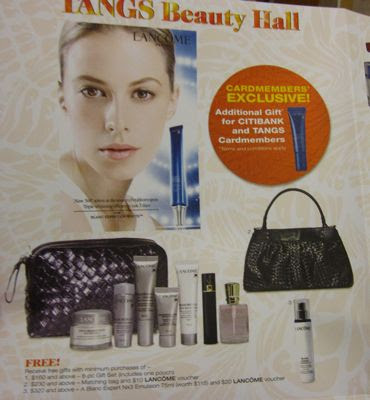 The mailer also featured a bunch of Lancome GWPs and promotional bundles. 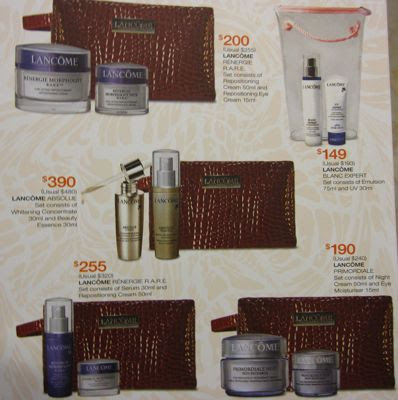 For purchase of $160, you can get an 8-piece GWP; with $230, you get a matching bag and $10 Lancome voucher; with $320, you get a Blanc Expert Nx3 Emulsion 75ml worth $115 and a $20 Lancome voucher. 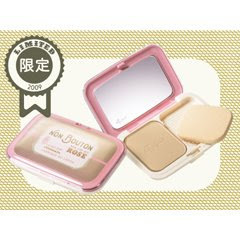 Cardmembers also get an additional Blanc Expert skincare item. Just received my CP haul from my friend in Tokyo! Everything looks so pretty in the palette, I didn't regret getting any of them even with the astronomical heights that the yen is at right now. I'll try to post reviews soon after I get the chance to play with everything! 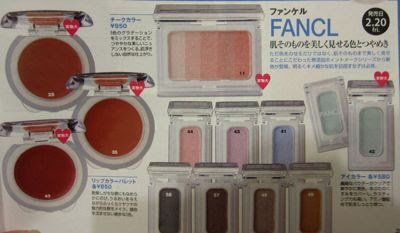 Ettusais will release a limited edition powder foundation case as part of a set on 19 March in Japan. The set, which retails for 3150yen, comes with either the Zero Pore Oil Block Pact Foundation or the Zero Pore Dry Block Pact Foundation. The Lavshuca website has been updated with the new Spring '09 collection which will be released on 1 February in Japan. The four looks for this collection. The Puffy duo's lashes look amazingly lush but I'm pretty sure this is with the help of falsies. 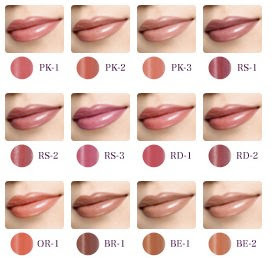 The new design of the website is more user-friendly as there are now swatches on models for the lipstick and eyeshadow shades, which are very helpful. 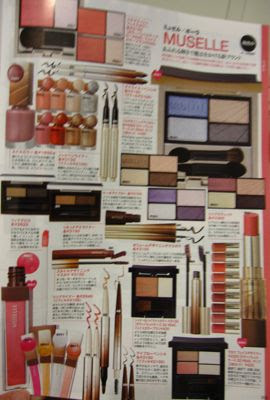 The Coffret D'Or website has been updated with the new base makeup collection which will be released on 1 March in Japan. The foundations are made with a "Change Block Fixer" and two types of "Poreless Powders" to cover up pores and better lasting power. 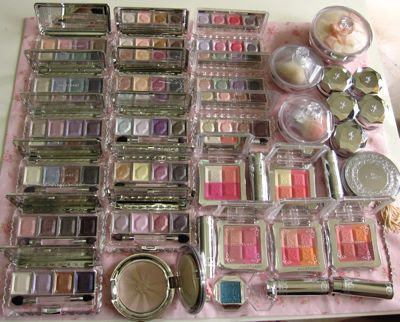 The Poreless Powders contain dimethicone-based gloss polymers. It'd be interesting to see how the Lasting Power Veil UV compares to Revue Superior Stay UV Fix which was one of Revue's powerhouse products. I also found it strange that the Change Block Fixer in the Lasting Power Pact Foundation contains mineral oil, given that the foundation markets itself as being long-lasting and sebum-resistant. But the Change Block fixer in the Gel Foundation, Lasting Power Veil and Magical Flat does not contain mineral oil. 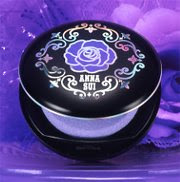 Anna Sui will be launching the following new products on 5 March in Japan. 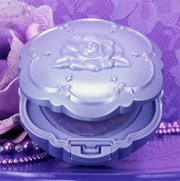 I've got my eye on the lilac Compact Powder G! 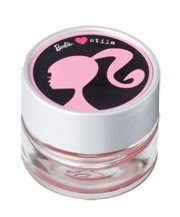 As reported earlier, Stila will be releasing several Barbie items that appear to be exclusive to the Japanese market. 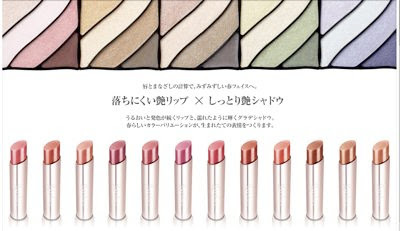 I'm hoping that these will show up on Stila's US website as the items are super pricey in Japan, given the astronomical yen now. 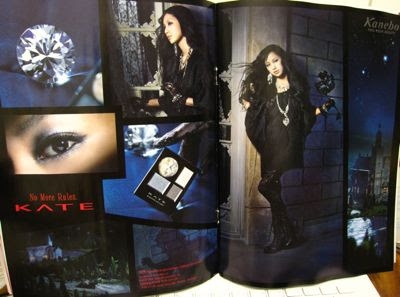 I calculated the whole collection will cost 51975yen, which is about US$587. Yikes! But knowing how Japanese ladies love anything cute and doll-like, I'm sure this will sell out in a flash. 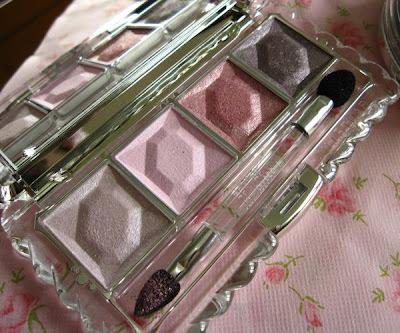 The Maquillage website has been updated with the new Spring '09 collection! 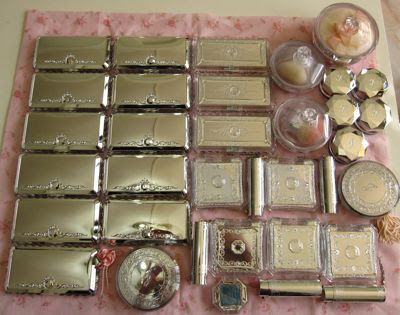 This looks much more interesting than the Majolica Majorca one, which has only a pitiful four items. I like the new ad visuals with the three new spokesmodels who help the brand a more youthful and energetic feel whereas previously it tended to have a staid, safe image. The website also has the five new TV ads and backstage shots. Do check them out! In one of the backstage photos of Pace Wu, it looks like Michael Thompson is the photographer. 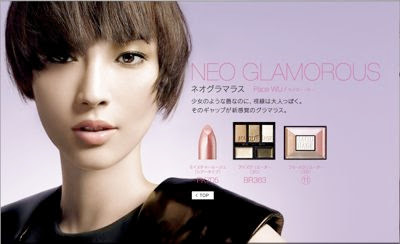 He shoots most of Allure's magazine covers as well as all of RMK's ad campaigns. The Majolica Majorca website has been updated with the new Chapter, Girly Erotica. Personally, I find the ad visual and theme for this collection utterly off-putting as I hate spiders and the model looks awfully silly with the horrible blonde wig! 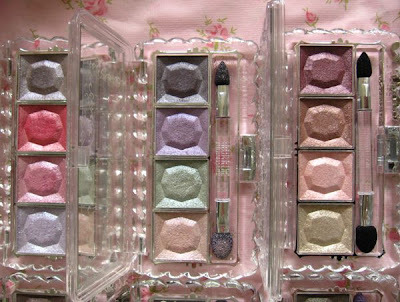 It's strange that MM is not releasing any eyeshadows this spring as that is usually one of the larger collections out of the four that MM releases each year. 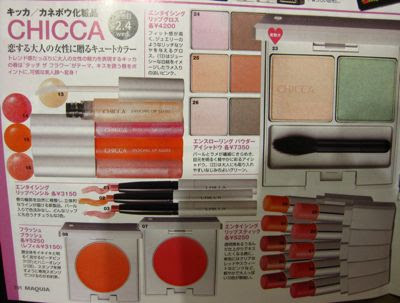 Here are some shots from the Maquia spring collections catalogue, which includes some brands that were not featured in the Voce and Biteki catalogues. What I find very useful about the Maquia catalogues is that they print life-size pictures of a couple of products in each collection. 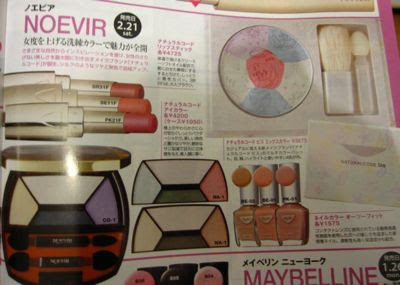 They also print pictures of how each product looks like, with accompanying color swatches for lipglosses, mascaras and liners. 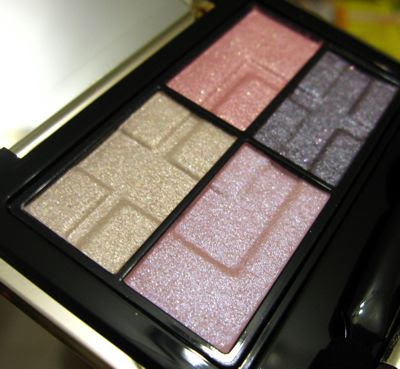 The new Deep Trap Eyes GN-1 palette looks quite interesting in this pic! Ad visual for Kate's spring collection. Juicy Couture opens in Singapore! Paul & Joe Disney Haul!